AQUAAIR wins the 1st main prize! The award ceremony of the Innovation Award Bavaria 2018 took place on 26 November in a ceremonial setting in the Hall of Honor of the German Museum in Munich. The Bavarian State Minister for Economic Affairs, Regional Development and Energy Hubert Aiwanger honored together with the President of the Bavarian Chamber of Commerce and Industry BIHK e. V. Dr. Eberhard Sasse and the President of the Association of Bavarian Chambers of Crafts Franz Xaver Peteranderl seven winners for their outstanding innovations. – In total, more than 190 companies based in Bavaria applied. Due to the cold flow of the polymer material, the geometry of the AQUAAIR alpha screw profiles during operation is optimized wear-free and without material removal, so that a gas-tight pressure chamber is currently being produced in unachieved quality. As a result, the delivery volume and thus the energy efficiency of the AQUAAIR screw air ends is significantly higher, especially in partial load operation, than with conventional rotor materials. With the AQUAAIR technology, oil-free compressed air generation can save up to 35 % energy costs – with maximum availability, maximum service life and 0 % oil. We at AQUAAIR are proud of the 1st main prize and say thank you! Your Browser doesn’t support this video format. 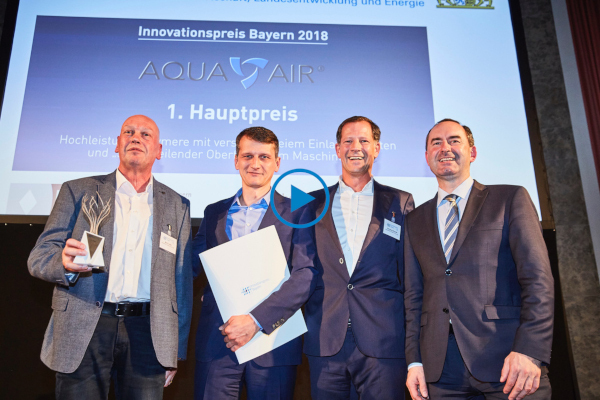 You can download the video here: Innovation Award Bavaria 2018.